We are slowly working on house projects. Very slowly, unfortunately. Trying to fit painting, decorating, landscaping & DIY-ing into our regular schedules is cumbersome. I’m learning to just enjoy our home in its current state, because it’s going to be a long time before the transformation is complete! One thing about moving to a new house is that not all of our furniture “worked” in our new space. 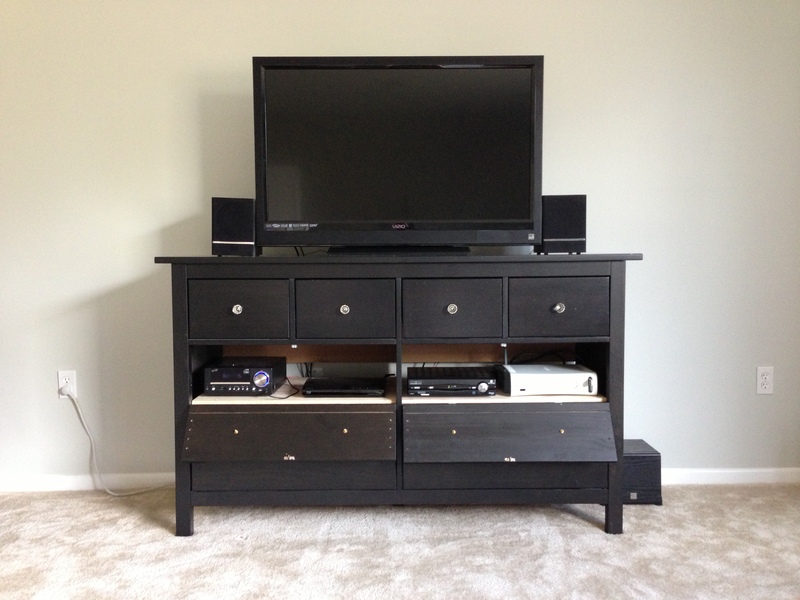 One such item was our TV cabinet for the family room. Our last living room was half the size of the current one, so the media center looked like doll house furniture against the giant wall. When I started pricing new media centers that would be larger, I got a major case of sticker shock and realized we weren’t ready to make that kind of financial commitment to a piece of furniture. 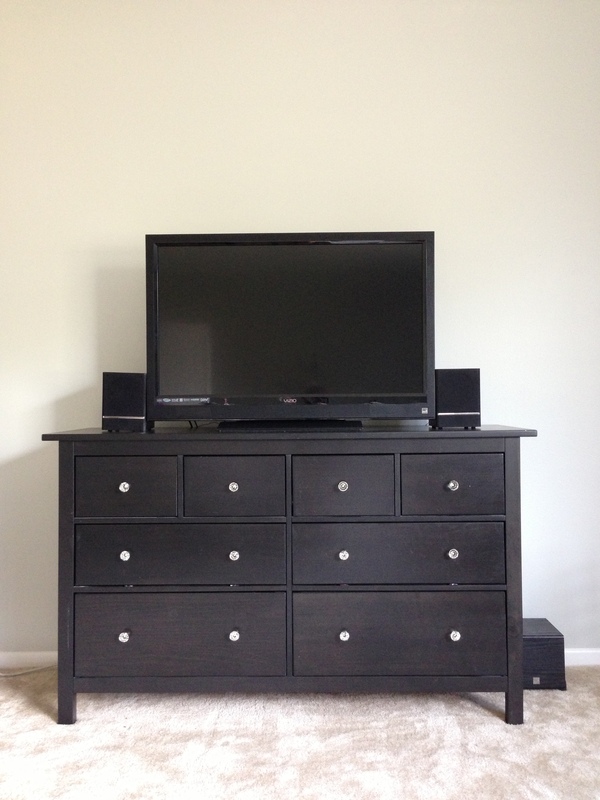 I happened to have a cheap IKEA dresser that wasn’t being used that I thought might work. 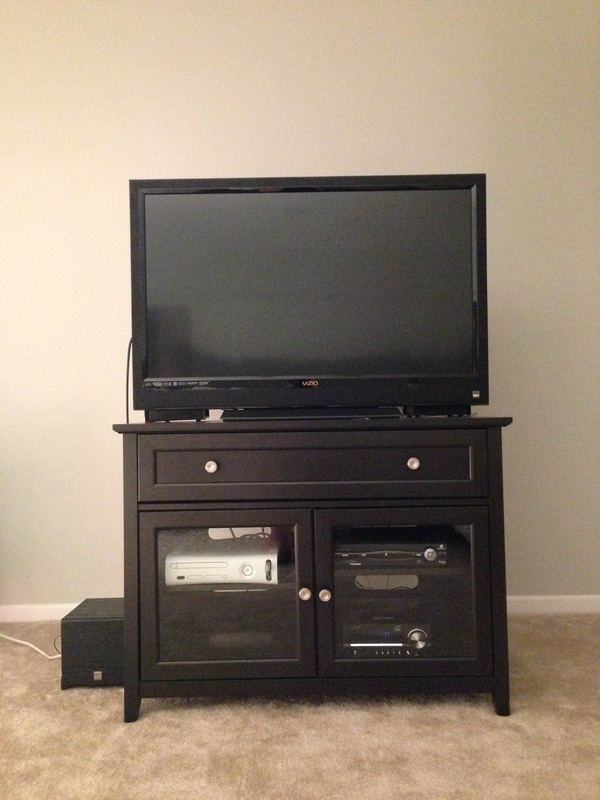 (I did replace the knobs with prettier Anthropologie knobs back when I bought it.) In a perfect world, I would get rid of the last cheapie furniture in our home, but at this point, we have to set spending priorities because there are literally hundreds of things we would like to do indoors and outdoors at our new place. So back to the IKEA dresser. I figured it would look better in our family room since it was longer and taller than the last piece. 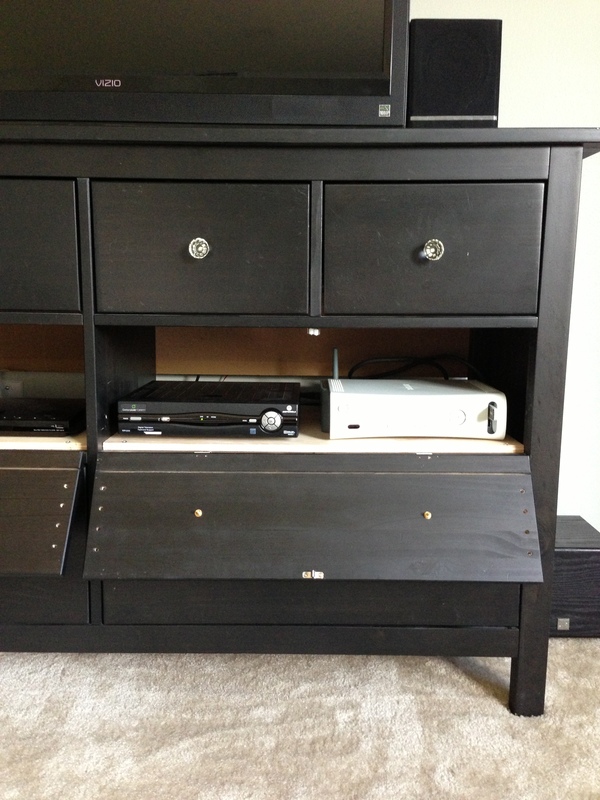 The only problem was that if we put our DVD player, iPod player, Xbox and TV receiver inside the dresser drawers like I had envisioned, the remotes wouldn’t be able to communicate with them through the faces of the drawers. Whomp whomp. So to Pinterest I went to find a solution. I came across this picture and though I found a winner. 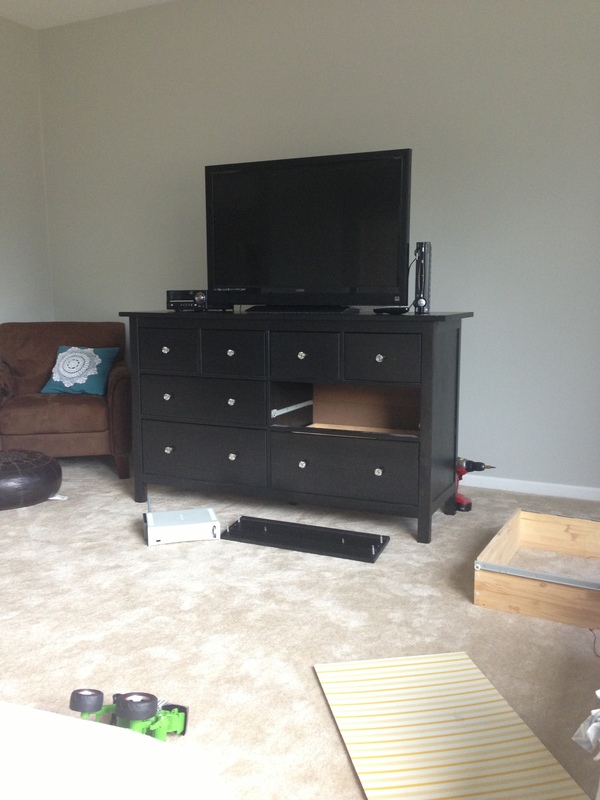 I showed it to Mike and he agreed to get his DIY on to make his wife happy, even though he stated that he had no issue with the current TV cabinet. Men. They’re not into the nuances of decorating. He went to the hardware store despite his indifference, and came home with plywood, hinges, and latches. He popped the fronts off of the two drawers we were working with. The drawers that needed to be transformed had to have the original bottoms removed because they were too flimsy for the heavy boxes to sit on. Once the new bottoms were in, he added the hinges so that the fronts could lay flat allowing the remotes to “talk” to the devices. Then he added the latches at the top so that when the drawers are closed, the tops won’t lean and will look just like they used to before we made these changes. I came in to help with the very serious task of using a Sharpie to paint the bright silver hinges black so they’d blend in with the dark brown dresser. What would he do without my help? The next step will be figuring out how to decorate the wall behind it. Any suggestions? 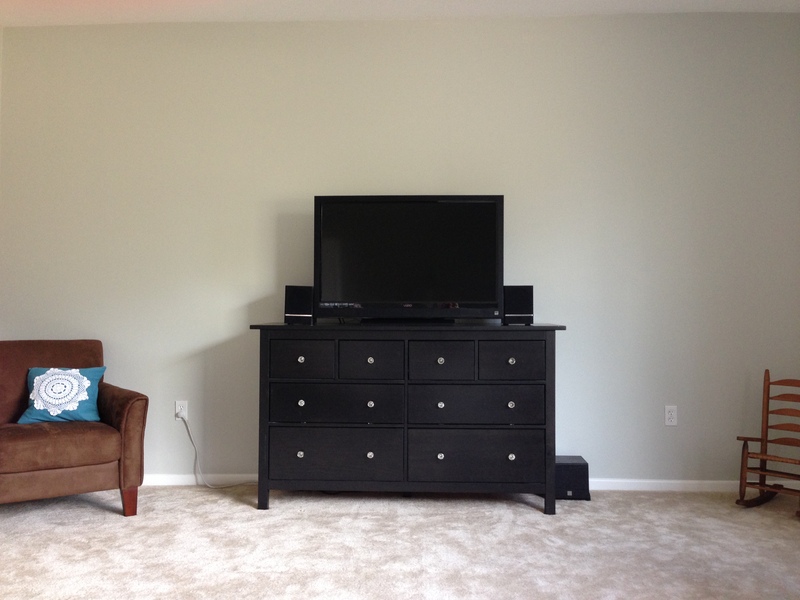 Not sure whether to put things on the wall on either side of the TV or how to spruce that space up. 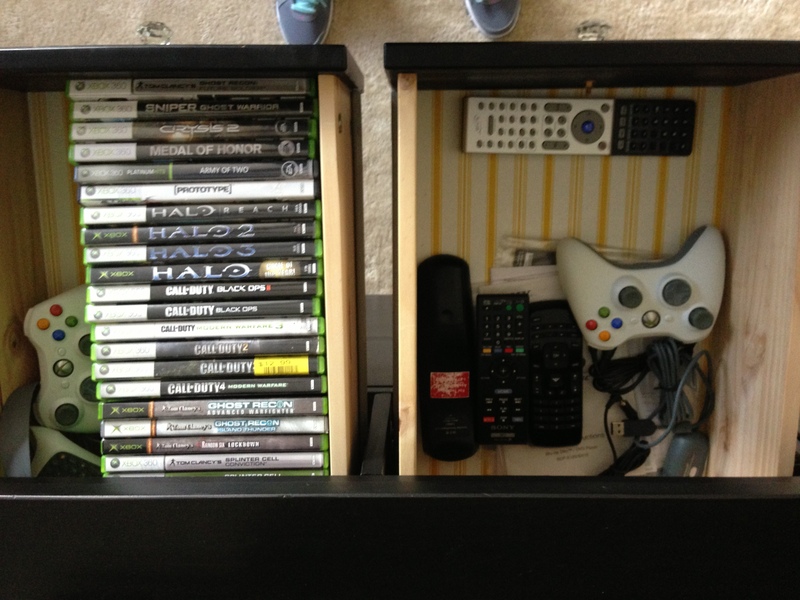 The top drawers can be used to store important things like Xbox games and remote controls to keep those lovely items out of sight.